This week I would like to introduce you all to friend and faithful reader of Joy De Vivre, Tsuki! Little Gray Fox is the Etsy shop ran by Tsuki. Seattle office worker by day, crafter and photographer extraordinaire by night, Tsuki has stocked Little Gray Fox with embroidery, polymer clay accessories, photography and more. Custom orders are always welcomed as well. 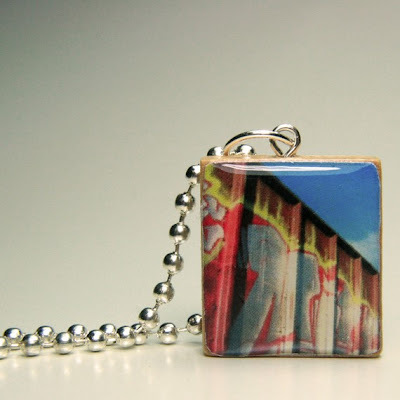 This pendant was crafted using a photograph taken by Tsuki, attached to a scrabble tile, and then topped with a glaze to provide protection. Stitched from felt and full of fiber fill, this adorable panda can be clipped on a purse, key chain or any other place that is need of a touch of cuteness! Fresh dried lavender placed into this sachet will have your closet smelling heavenly. Bonus not only does it smell good it is also a bright and pretty decoration. This week if you are the lucky winner you will have the choice between two prizes from Little Gray Fox! 1. Check out Little Gray Fox and come back here to rave about your favorite item(s). 3. Be or become a follower on Joy De Vivre's facebook page for a third entry. Entries will be accepted from now until next Monday at noon! Check back that night to see if you are the lucky winner! can I enter this giveaway if I just won or is it disliked ? Just wanted to know the etiquettes , thanks . I have visited her shop before and I really love it! What a great promotion. Look at all the fabulous photos you've posted here! Tsuki's work is compelling because she has a knack for recreating the natural world in miniature. I think I first noticed her work when I saw the Bird Nest Bobby Pin made in polymer clay. These pins are sweet, realistic reproductions, and it's easy to imagine someone wearing them! I also love the Donut Bobby Hair Pins. They offer all of the cuteness and none of the stickiness! I continue to encounter bloggers and other people in the hand crafting community who rave about Tsuki's work, and these sincere recommendations also have caught my attention. 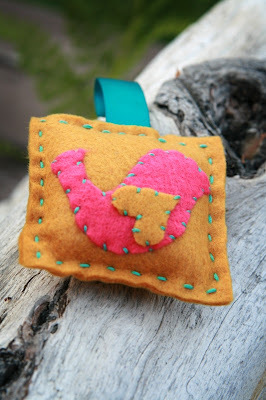 I think that Tsuki is smart to offer such a wide range of handmade product in her Etsy store. This is also a demonstration of her talent and creativity! Her stuff is so adorable. I love her! I think my favourite is the deer embroidered wall art. 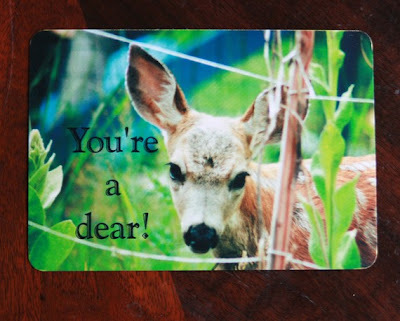 I'm a sucker for deers! I love the birds nest hair bobby pins, they would be fun to wear. And the sad Panda is just adorable. following joy de vivre on gfc as jhb. That one with the deer is a dear! I love the donut hair pins! I would totally wear them! I just got back from the Bahamas, so I love the Tropical Palm Trees Scrabble Tile Photo Pendant! It reminds me of my vacation. I want it! 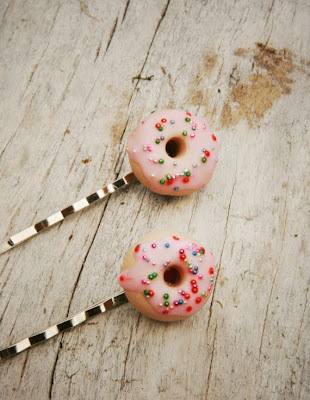 Oh my, the donut hairpins look delicious enough to eat! I also like the Pink Donut Sprinkles Adjustable Ring, this would go so well with the donut hairpins! Donutholics go! i love the birds nest hair pin. so whimsical. I like the Le Pouf in Pieces Dandelion Wall Art Trio on the LittleGrayFox Shop's website! !